Bread-making has always been a daunting task because my bread seldom comes out as fluffy and soft as I wanted them to be. I did consider buying a bread machine but X and I don’t eat much bread so I think it will be underused and a waste of counter space. Handheld mixers usually come with dough hooks as well, and while I had success kneading dough with them before, I realised that the engines of handheld mixers usually cannot cope and overheat easily – one of my handheld mixers overheated and broke down while kneading bread (*horrors*)! In addition, I had to hold on to the mixing bowl real tightly as it had a tendency of flying out when I kneaded the dough with a handheld mixer. So, I put off baking bread (making only no-knead breads) for the longest time ever until I received my first-ever stand mixer – the Kenwood Chef Sense! No wastage of counter space because I can use it to bake cakes and other yummy desserts (like this one); no more overheated and engines breaking down because this Kenwood Chef Sense is a real powerhouse that can make 2 kilograms of bread dough at one go; and of course, no more flying mixing bowls! So which bread recipe to try first? I really wanted to try making the TangZhong bread again (first tried it about 3 years ago with the Hokkaido Milk Rolls which was also the bread that caused my handheld mixer to breakdown) so I whipped up a batch two weeks ago. But then I realised after that the bread recipe is not TangZhong at all! That recipe uses a Scalded Dough starter where flour is mixed with hot water into a dough and chilled overnight before being added into the main dough. So I re-Googled the recipe and ended up at Christine’s Sausage Roll recipe, and this is what I’m sharing today! Grabbing one for a snack! TangZhong is a roux invented by the Japanese – the roux is made by cooking bread flour and water (or milk) together in the ratio of 1:5 (by weight). This roux, after it has cooled down, is then mixed into the rest of the ingredients and knead together. I don’t really know the science behind it, but Google found quite a number of websites which explain all about TangZhong (see here, here and here). Apparently just this bit of flour and water can result in a softer and lighter loaf of bread with a longer shelf life – and that’s all that matters to me! I think the bread flour I got here is slightly different from Singapore’s because they don’t seem to absorb moisture as well, hence the dough ended up quite sticky. Luckily I have the Kenwood Chef Sense to do most of the kneading work! I only kneaded for the last 5 minutes so I can test the dough and shape them into a ball for proofing. 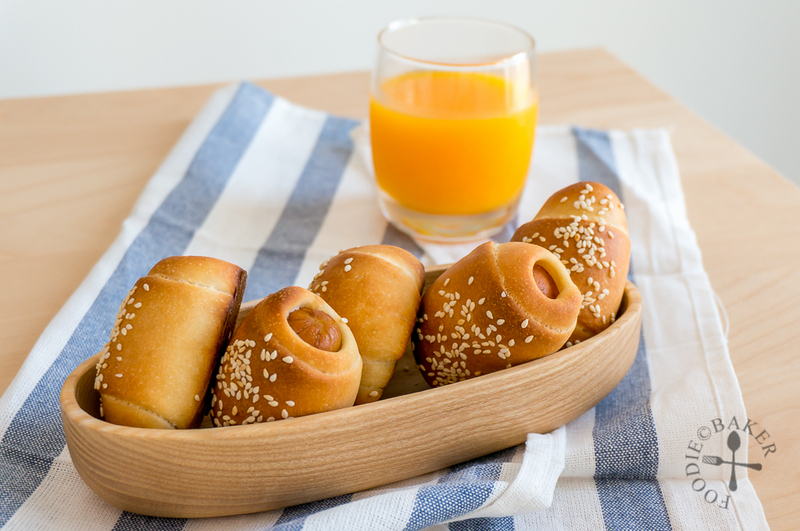 Christine’s recipe yield a huge amount of dough – about 750 grams, and because I only had 3 sausages left, I took 1/4 of the dough and made them into 6 mini sausage bread rolls, just because they look a lot more adorable hehe. The rest of the dough are currently being chilled in the refrigerator – I’ll whip something up with them soon! 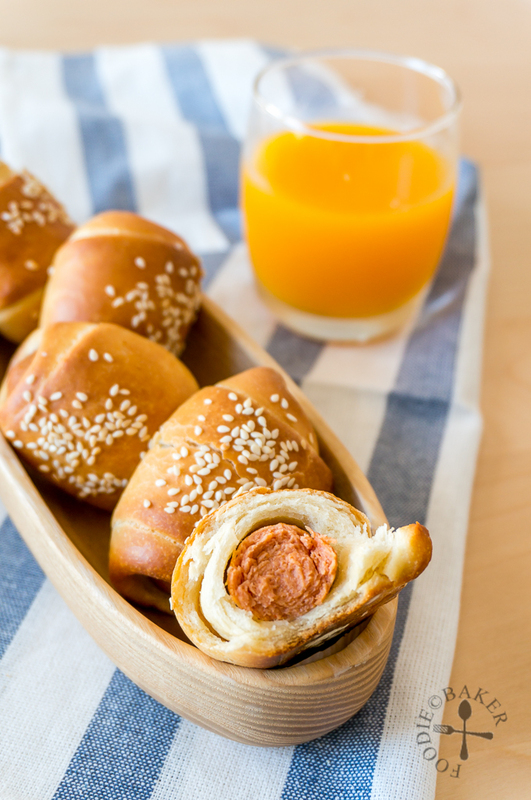 Because the sausage bread rolls are only about 6cm (2.5 inches) big, they are perfect for breakfast, afternoon tea or as a quick snack! I’ve been eating the sausage bread rolls for breakfast for 3 days straight and I must say, it is definitely a lot softer than other breads I’ve ever baked. The bread on the 3rd day is definitely not as soft as the bread on the 1st day, but it’s definitely a lot softer than other breads that I’d baked without the TangZhong. So this TangZhong bread is definitely a keeper! Instead of showing step-by-step photos today, I’ll be leaving you with two videos – one on how to make the basic TangZhong bread dough, and the other on how to shape and bake the sausage bread rolls. I’ve thought of doing more videos in the future but recording and editing them is quite a tedious process. But I think a video is much better because if a photo speaks a thousand words, then a video will be able to convey a lot more! A huge, huge, thank you to Kenwood for sponsoring me this Kenwood Chef Sense, which really helps make my life more convenient and a lot more fun. The Kenwood Chef Sense is available at leading electrical retailers and department stores, at promotional prices of S$749 for Chef Sense (4.6 litres) and S$899 for Chef Sense XL (6.7 litres)! 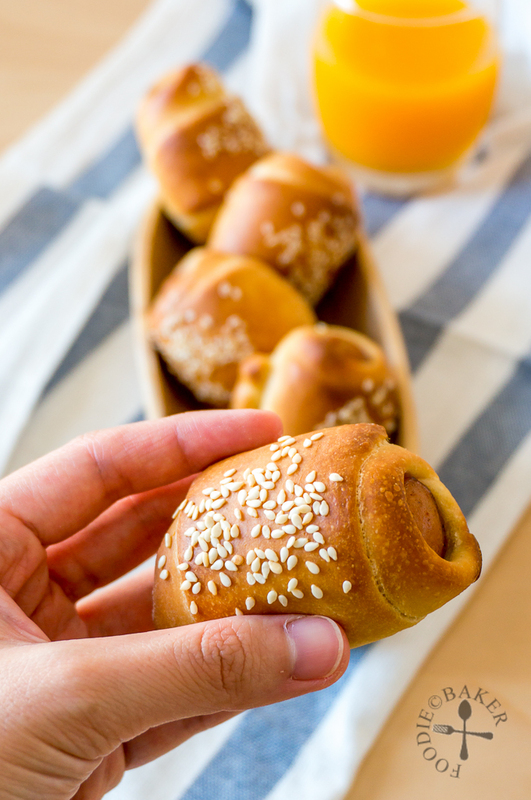 And here are the videos and recipe on how to make the TangZhong sausage bread rolls! Edit 8/8/2016: Recipe edited to include timings and notes on milk for the Main Bread Dough! Lightly dust the table top with bread flour again. Turn the dough out again onto the floured table top and knead for 2 minutes. Divide the dough into 24 equal pieces (about 30 grams each) and roll each piece into a ball. Cover with clingwrap and let rest for 10 minutes so the dough is easier to handle. Take a piece of dough and roll it out into a circle/oval. Fold the sides in so it resembles a cone shape, then roll it out as flat as possible so it becomes an inverted triangle. Place a piece of the sausage on the wide end of the triangle then roll it up. Place the bread roll seam-side down on the baking sheet. Repeat until all the dough and sausages are used up. Cover the bread rolls with clingwrap and set aside in a warm and draft-free area to rise for another 1 hour. Discard the clingwrap covering the bread rolls. 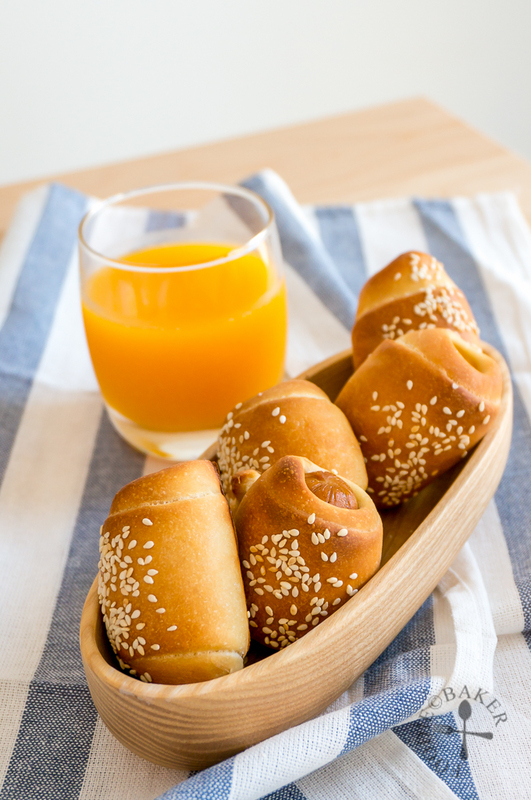 Brush the top of the bread rolls with milk and sprinkle sesame seeds generously on top. Press down on the sesame seeds gently so they adhere to the bread dough. Bake for 15 to 20 minutes until the top is golden-brown. 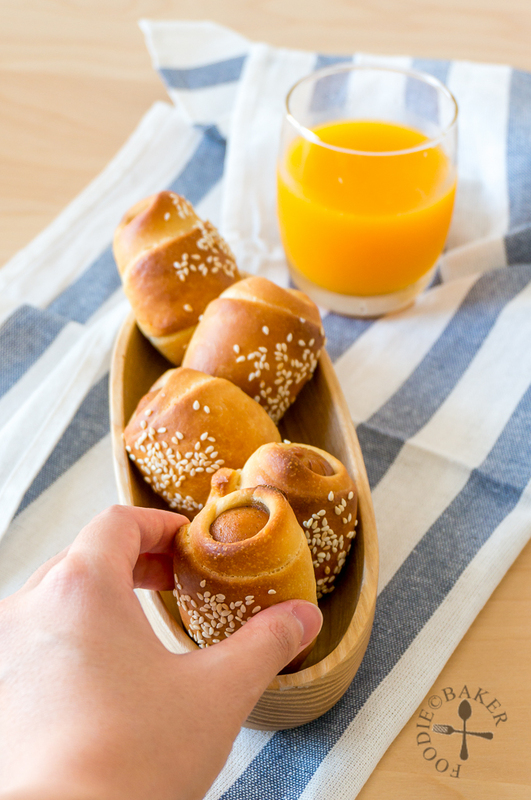 Transfer the baking sheet onto a wire rack and let the bread rolls cool. Serve warm or at room temperature. Keep the bread rolls in an airtight container. The bread rolls can be kept at room temperature for 2 to 3 days. If kept in the refrigerator, for up to 5 days. 4) The recipe makes about 700 to 750 grams of bread dough. If you don't want to use all at one go, take the amount of dough you don't plan to use, wrap tightly with clingwrap and store in the refrigerator. Use within 2 or 3 days. Full Disclosure: I was gifted with the Kenwood Chef Sense – no other monetary compensation is received. All opinions, recipe and photos are my own! This will produce 120g tangzhong? Hi Imz, this will produce about 120 grams of tangzhong. The yield depends on how long you cooked your tangzhong. If you have more, you can use all, just adjust the amount of liquid added according to the dough’s needs. Oops, I forgot to ask, how long was your total kneading time using Kenwood? Hi Jasline, have you ever achieved windowpane with this Kenwood (i.e. without having to manually knead at the last stage)? I have just bought a Kenwood KM636 and it takes ages to knead and still yet to reach windowpane stage. Hi Tan, I usually knead for about 8 to 10 minutes, then manually knead for about 30 seconds. The dough should be smooth like a baby’s bump. When I do the windowpane test, I pinch a piece of dough, and sort of knead it between my hands – the dough will from sticky become smooth, then do the windowpane test. Usually my dough is a bit too sticky straight from the bowl, but after a little bit of manual kneading it will be smooth. Not sure if my explanation is clear enough, let me know if you have more questions! These look amazing. Tangzhong is absolutely new to me. I am wondering if I am pronouncing it right. I hope to try one day. How I would love making a basket of these rolls. They make perfect on-the-go food: grab a couple on the way out and enjoy them along the way. Never heard of this manner of making bread dough, Jasline, but I’d love to give it a try. Thanks for sharing. This is delightful! I am definitely inspired and would love to be able to make these for my son. : ) I have heard so much about the tangzhong method and have to try one day. These little sausage bread rolls really turned out wonderfully. I really must try out bread using tangzhong method…. 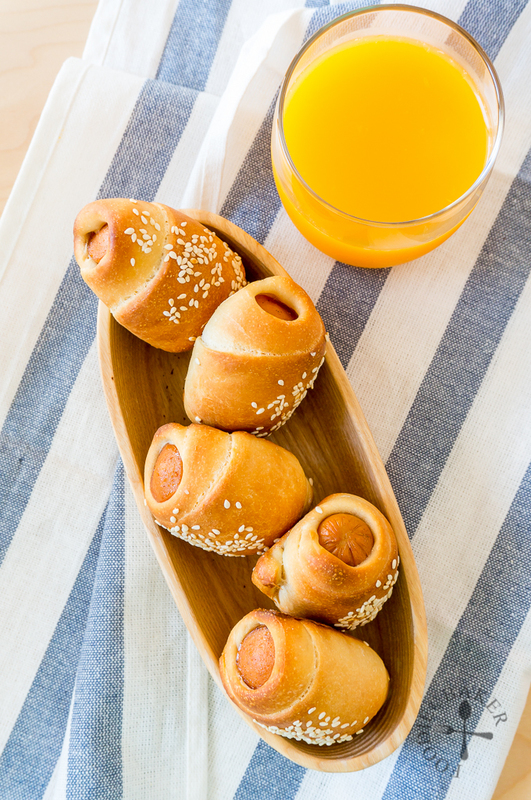 I feel like grabbing one of these yummy mini sausage rolls !